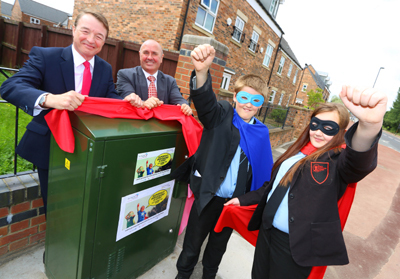 NEWCASTLE marked a key milestone in the city’s superfast broadband roll-out by launching the first fibre cabinet as part of the Go Digital Newcastle programme. 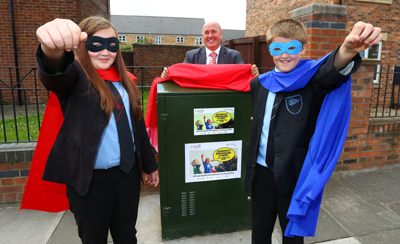 Pupils from Walker Technology College were on hand to add a dash of superpower to the occasion as they officially unveiled the new fibre cabinet serving Wyedale Way in Walker, which will enable residents to enjoy broadband speeds of up to 80Mbps and transform the way they can use the internet. Nearby residents will be among the first to benefit from the latest fibre optic technology as a direct result of the programme – as their green street cabinet was hooked up to the fibre network by Openreach, BT’s local network business. In total around 1,400 homes and businesses in Walker, Byker, Cochrane Park, Manor Park, Elswick, South Benwell and Fenham will be upgraded to high speed broadband over the next few weeks, in what is the first phase of the multi-million pound programme. Cllr Ged Bell, cabinet member for Investment and Development for Newcastle City Council, said: “We’re delighted to be here to mark this significant step in the Go Digital Newcastle project. “We’re improving superfast broadband availability across the city in six phases between now and next Summer, with this cabinet here in Walker among the first to go live. “This first phase of the project will make it available to around 1400 premises in the city over the coming weeks, and local people who choose to sign up to a superfast package will find huge benefits. The Go Digital Newcastle programme is run by Newcastle City Council with government funding from Broadband Delivery UK and a £1.89 million investment by BT. It will make Newcastle one of the best-connected cities in the UK. The programme will build on BT’s commercial investment which has already brought fibre broadband to many locations including central Newcastle, West Newcastle, Gosforth, Jesmond, Lemington and Wideopen. By the end of summer 2015 fibre broadband will be available to 97 per cent of the city. Communications Minister Ed Vaizey, said: “This is great news and marks the beginning of the transformation of broadband in Newcastle, which is on track to deliver access to superfast speeds to 97 per cent of the city by Summer 2015. Simon Roberson, BT’s regional partnership director for the North East, added: “Everyday the number of services delivered to us online, whether to entertain, educate or meet our daily needs, is growing, and more and more of them need fast reliable broadband to work properly. Students at the nearby Walker Technology College already benefit from excellent broadband connections at school, but head teacher, Mike Colliersaid that having faster broadband at home could be a major benefit to them. He said: “Use of the internet now touches every part of the curriculum, with pupils using it every day for everything from interactive exercises to doing online research for school projects and a variety of other schoolwork. Without fast connectivity and speeds there is the risk that children will miss out on what is now an essential learning tool. It’s predicted that superfast broadband will provide a huge boost to the local economy as residents and businesses sign up and speed up their connections. Residents who wish to take advantage of faster broadband connections need to sign up for a fibre broadband package with a supplier of their choice. As part of Go Digital Newcastle, small and medium businesses in the city as well as charities and social enterprises can apply for a voucher worth up to £3,000 to get connected to improved broadband. They can also apply for funding of up to £2,000 for equipment, and for free expert business support to help them make the most of the new connections. More information can be found on the www.godigitalnewcastle.co.uk website.